At Ladies at the Bar, we love a good beer but this lady also enjoys the occasional glass (or bottle) of wine. (After our trip to Milwaukee beer has lost some of it's appeal). For my birthday, a few of my friends gifted me a subscription to Club W. Club W is a like a Birchbox for wines. For $45 a month ($39 for the wine, $6 for shipping) you receive 3 bottles of wine (or more if you choose), which they tailor to your taste preferences. When you first sign up for Club W, they ask you a series of questions so that they can figure out what kind of wine you would like most. For me, it was mostly dry reds with a few whites thrown in. Club W will give you a list of recommendations, but you are also free to select whatever wines you want - but be warned they have many to choose from! They also have videos accompanying each wine so you can learn more about it and a helpful guide for recommended pairings. The night I signed up to redeem my present I must have spent over an hour going through the videos/website trying to decide which wines to buy! The thing that I really love about Club W is that they don't just have a bunch of run of the mill wines, but they pride themselves on curating unique wines that you might not regularly try. The cut out the distributors which allows them to sell higher quality wines at a lower price than usual. Most of their wines are around $13, but they have "Curator's Choice" wines that are a bit more pricey. As a person who routinely buys whatever wine is cheaper than $15 at Whole Foods, this was a nice change of pace for me. For my first Club W shipment, I chose Le Fermier Cinsault, Trestle Chardonnay and Les Bobos Carignane. I still have yet to drink the Chardonnay. However, I really, really enjoyed Les Bobos. 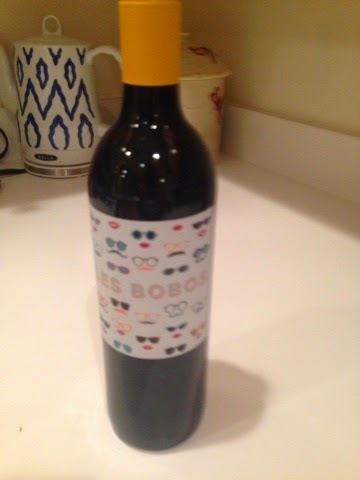 It came in a super cute bottle and it was unlike most red wines I've had before and it tasted both jammy and dry. As soon as you put in your payment details, you are automatically subscribed to receive new wine every month. You are able to skip months, but unless you go into your profile and select this option, your wine will still be shipped. This happened to me my second month (still hadn't gotten through the first shipment!) and I was a little peeved - but more wine is never a bad thing! Another thing to note, you MUST have someone older than 21 to be present at the time of delivery. Because I work 9 to 5, this was a little difficult for me to figure out. Thankfully, having a doorman can get you out of this situation. Club W makes a great gift or a treat for yourself!